As great as their debut was, a more up to date progressive style was what Nektar comes up over year later with "A Tab In The Ocean". For a lot of fans this album results in the definitive Nektar-style. The 1st side of the album consists of one piece. 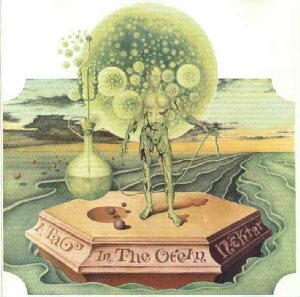 "A Tab in the Ocean" is space rock with lots of guitar and organ playing, with reminiscences of King Crimson and Moody Blues. Final titles "Crying in the Dark" and "King of Twilight" are hard rock as it should be, forming natural points of culmination in the musical flow. The heavy played parts are organically incorporated into the whole and do not stand isolated. Mellotron and guitar conjure up vigorous but beautiful sounds, and in spite of the powerful expression, the highly original sounds do not go under and make sure that the group demonstrates their ability once again. Album is remastered from the original master tape and sounds brilliant. There is an insert with band story and rare photos. A must have! !